Because Ford and Mercury commonly used "planking" lines in their woodgrain, we offer this feature in our printed woodgrain material in order to give you that original look. 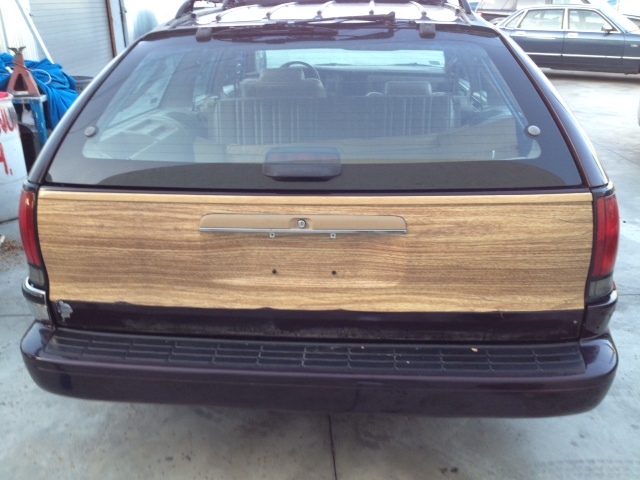 We offer a service to refinish fiberglass and alunimum trim for vintage wagons. We do not "cover" the trim with an applique. We use a painting process with an ink transfer that is done by hand. It is labor intensive and takes time. Therefore the turnaround time can be several months. There are variables that affect the cost of trim refinishing but the average cost is $800. Medium maple: 1956 Country Squire. The Roadmaster Wagon is a recent classic. Our light tan woodgrain is based on our reproduction from an NOS piece of orignal woodgrain. This color and grain works well for 80s GM wagons as well as Vista Cruisers. Note: Although we have attempted to achieve a woodgrain pattern and color that is close to original for vintage wagons, we cannot provide an exact match to factory. We consider our trim refinishing to be the next best thing to NOS. Pricing: $690 for our standard size kit. These measurements are included in our standard size kit. Copyright 2016 woodgrain4wagons. All rights reserved.